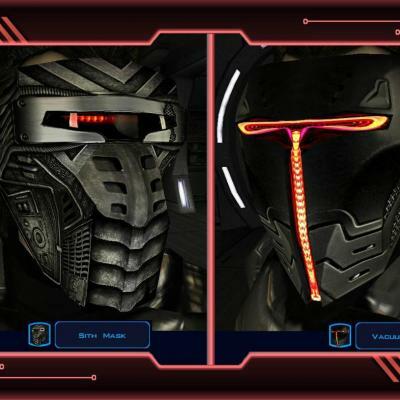 A Mod for Star Wars Knights of The Old Republic Author: Darth Vhail Release Date: 05.01.2017 ->Description: This mod adds new graphics to the Sith/Stabilizer/Vacuum Masks and Motion Detection/Stealth Field Reinforcement Goggles found in-game. It also adds new icons for these items. ->Installation: To install you need to copy the files into your KotOR override folder. 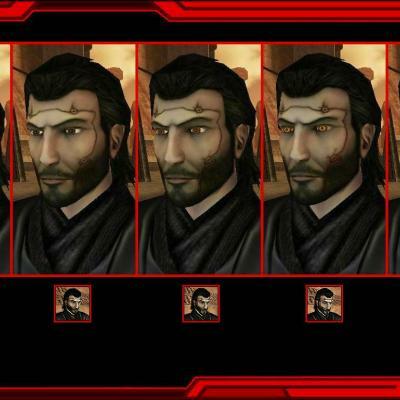 ->Compatibility: If you have other mod files changing the appearance of the Sith/Stabilizer/Vacuum Masks and Motion Detection/Stealth Field Reinforcement Goggles, they will be replaced. 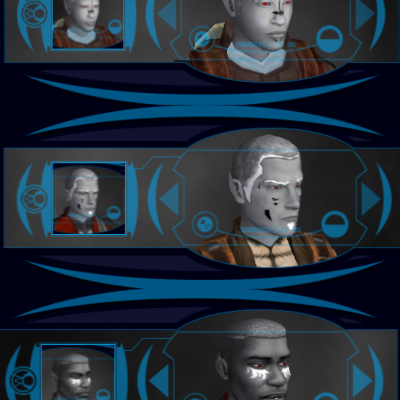 Also any mods that add new models for these four masks are incompatible with these textures. 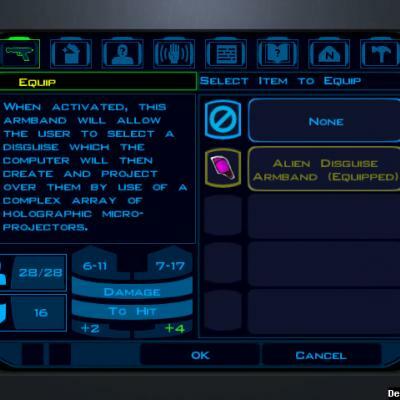 ->Legal: THIS MODIFICATION IS NOT SUPPORTED BY BIOWARE/OBSIDIAN ENTERTAINMENT, LUCASARTS, DISNEY OR ANY LICENSERS/SPONSORS OF THE MENTIONED COMPANIES. USE OF THIS FILE IS AT YOUR OWN RISK AND THE ABOVE MENTIONED COMPANIES OR THE AUTHOR IS NOT RESPONSIBLE FOR ANY DAMAGE CAUSED TO YOUR COMPUTER FOR THE USAGE OF THIS FILE. 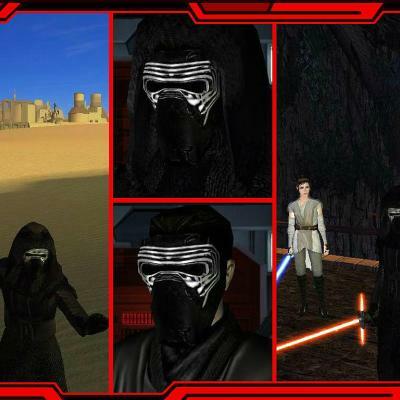 A Mod for Star Wars Knights of The Old Republic Author: Darth Vhail Release Date: 11.11.2016 ->Description: This mod changes the appearance of the Sith Mask found in Uthar's chambers in the Sith Academy on Korriban to resemble Kylo Ren's mask from Star Wars: The Force Awakens. 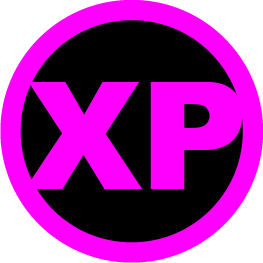 It also contains a new item icon. ->Important: For this to work you need to have Xander2077's "Vanilla Masks Overhaul 0.9" mod installed. Not a difficult proposition seeing as that mod is awesome. 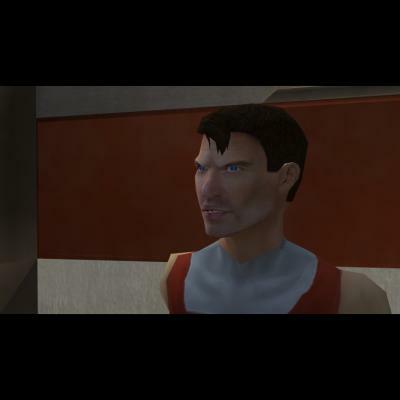 You can download it here: http://deadlystream.com/forum/files/file/867-vanilla-masks-overhaul/ ->Installation: To install you simply need to copy these files into your KotOR override folder and replace the "I_Sithmask.tga" and "ii_mask_013.tga" files from Xander2077's mod. 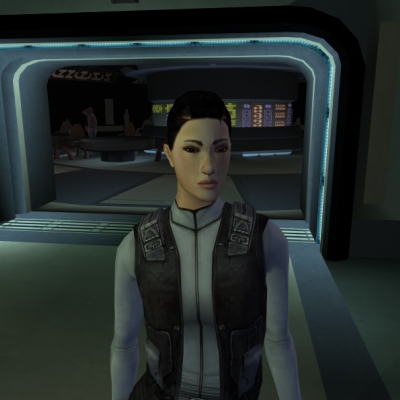 ->Thanks: I would like to thank Xander2077 for his "Vanilla Masks Overhaul 0.9" mod. Without it my reskin would not be possible. 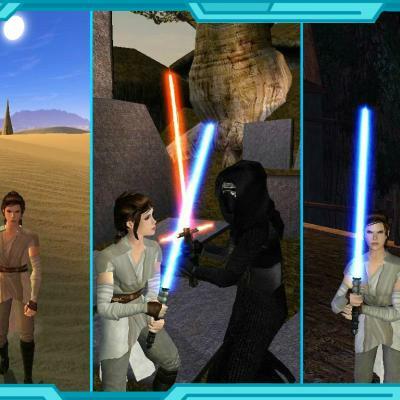 ->Legal: THIS MODIFICATION IS NOT SUPPORTED BY BIOWARE/OBSIDIAN ENTERTAINMENT, LUCASARTS, DISNEY OR ANY LICENSERS/SPONSORS OF THE MENTIONED COMPANIES. USE OF THIS FILE IS AT YOUR OWN RISK AND THE ABOVE MENTIONED COMPANIES OR THE AUTHOR IS NOT RESPONSIBLE FOR ANY DAMAGE CAUSED TO YOUR COMPUTER FOR THE USAGE OF THIS FILE. 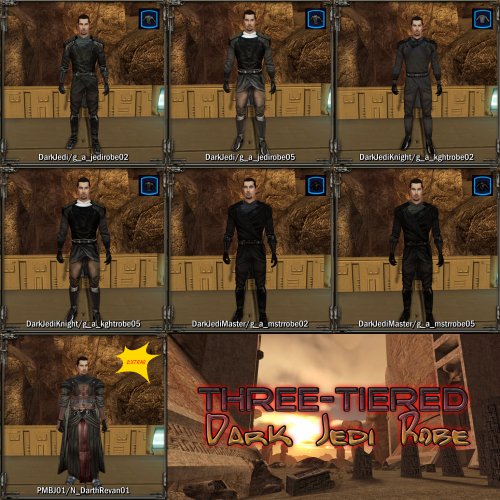 A Mod for Star Wars Knights of The Old Republic Author: Darth Vhail Release Date: 11.11.2016 ->Description: This mod adds a new graphic to the Qel-Droma robes found on Korriban, changing them (only for females) to resemble Rey's clothing from Star Wars: The Force Awakens. 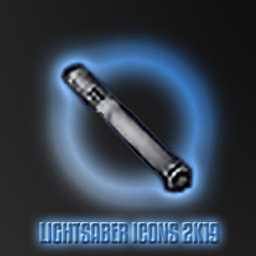 It also contains a new item icon. 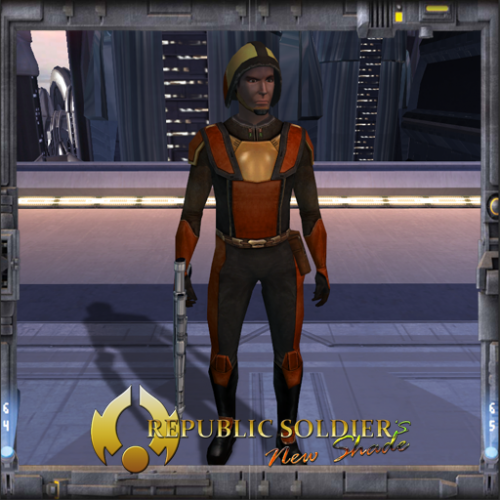 ->Installation: Simply copy the files into your KotOR override folder. 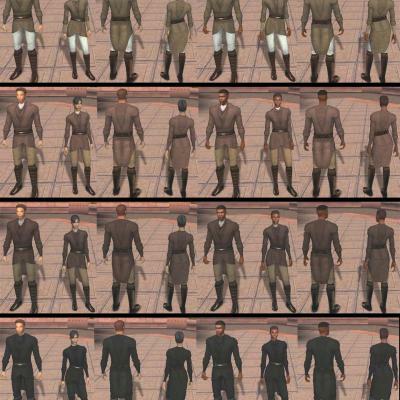 If you already have a file that changes the appearance of Qel-Droma's Robes for females ( the "PFBI05.tga" file) this will replace it. I recommend using the robe only on a Caucasian female because parts of it have been modified to show more skin (the neck, arms and hands), and it's white. It was, after all, made with Rey in mind. 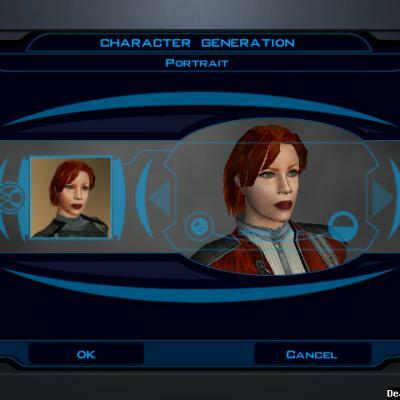 ->Legal: THIS MODIFICATION IS NOT SUPPORTED BY BIOWARE/OBSIDIAN ENTERTAINMENT, LUCASARTS, DISNEY OR ANY LICENSERS/SPONSORS OF THE MENTIONED COMPANIES. USE OF THIS FILE IS AT YOUR OWN RISK AND THE ABOVE MENTIONED COMPANIES OR THE AUTHOR IS NOT RESPONSIBLE FOR ANY DAMAGE CAUSED TO YOUR COMPUTER FOR THE USAGE OF THIS FILE. Why, hello again! This project took a few days and I can't help but say I've learned a lot doing it. I decided it would be fun to make all of the already-present male PCs into dark elves(a worlds-collide type deal). I have also gone to the extent of including the DS transition and icon textures, as well. I've taken the liberty of giving you a preview of the skins I have made, and you may also see that I've done minor modeling work to give each PC elf-like ears(except for Mullet Man, due to complications regarding his hair). Therefore, if you only want the normal facial textures, just use the model files! Hopefully some of you will enjoy this as much as I enjoyed making it. Once again, I definitely learned a lot. If you have any questions, suggestions, or adjustments you've made, let me know! This is a Tutorial I made back in the day for Lucas Forums. I have copied it here for new modders. This is how I maintain shadows in newly textured areas: Step 1: Open the file you want to work on (in this case P_BastilaBB01.tga). I usually save it right away as a Photoshop file, and rename it. Step 2: use the selection tools to outline the area you want to work on (see the dashed outline in the image above). Then create a new layer (for now it is called Layer 1 by default). Step 3: desaturate the new layer. This will make the layer appear as greyscale. Step 4: set layer 1’s Blend Mode to “Overlay”. This will make Layer 1 affect the layer directly below it. Now, the shadow areas will cause the layer below to become darker (aka “multiply”), and the highlight areas will cause the layer below to become lighter (aka “screen”). The closer to middle grey on this layer, the less the layer below is affected. Step 5: in order to increase the contrast, I usually use the Levels adjustment, so that I have a little more control. On the histogram in the middle, there are three sliders that control the Input Levels. By sliding the black one to the right, all the dark areas become darker. Sliding the white one to the left makes all the light areas whiter. When you slide the grey one to the left, more contrast. Slide it to the right, less contrast. Step 6: create any new texture you want on a new layer (in this case, a simple render clouds filter followed by the water paper filter). On its own, it looks fairly flat and lifeless. (I’ve also turned Layer 1 off for now.) Step 7: select the blank area of Layer 1. With this area selected, make Layer 2 active again. Then create a "Layer Mask". A layer mask controls layer transparency. Here you can see the layer mask as a little black & white picture next to the layer thumbnail. Basically, the white areas are 100% opaque (100% visible). 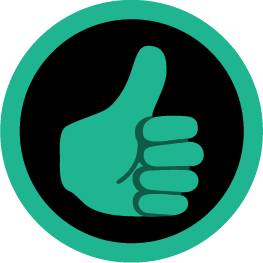 The black areas are 0% opaque (0% visible). Any greys will be partially transparent. (Advanced: you can edit the mask by clicking on its thumbnail, and painting with white, or erasing with black.) Step 8: now that layer 1 is turned back on (renamed to Highlights & Shadows Layer) it will cause layer 2 (renamed to New Effect Layer) to have a little more three dimensionality instead of being relatively flat. Step 9: if the highlights and shadows seem too harsh or contrast, they can be readjusted using Levels again. Here, the bottom two sliders are used, and they change the Output Levels. As the black slider moves to the right, all the dark areas of the layer become more grey (lighter). Similarly, as the white slider moves to the left, all the white areas of the layer also become more grey (darker).